Black is defined as 'the absence of light and the absorption of all color,' therefore, I believe that my black paper is looking for light and color to come alive. When I start a painting, I fulfill that quest. I try to create the positive of the light with the pure colors of pastels letting the negative of the rich black space make its own case for being left to itself. The key is in knowing what to omit and what to add, that is when my art comes to be, when my composition comes to life. Originally from California, Karen Cooper discovered color and shadow at a young age, often turning in illustrated elementary school assignments. After high school she studied art in Sweden as an exchange student, and returned to California to attend San Fransisco State University where she got a BFA in textiles. After an Associates in architectural design she embarked on a career as an architectural rendering artist. Karen moved to New Mexico with her husband Dwight to become a full-time fine artist in 2002. 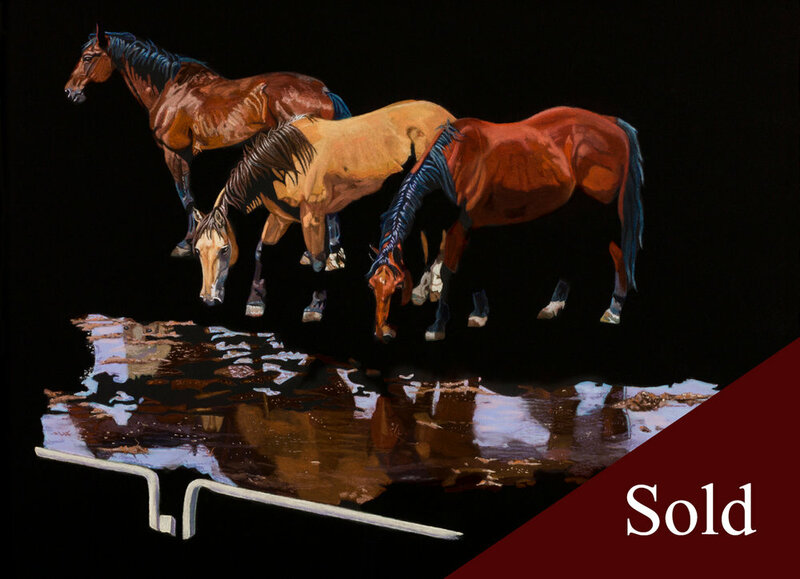 With increasing sucess in her career Karen was invited to exhibit at the Museum of Western Art in Kerrville and the couple fell in love with the Texas Hill Country. They resettled in the area in 2012, completing her eastward migration from California. Karen says that every time she moves east, she finds more "west" to paint. Karen is well known for action and movement in her paintings, as well as the drama of the negative space that is her signature. She has exhibited all over the U.S. and her work is held in museum collections in Texas, Georgia, and beyond.